Prepare your eyeballs, my friends, because this is a whole lot of skirt! It actually took about 5m of the 6m cut of wax print that I bought – and here I was thinking I could get a pair of pyajama pants out of the extras! 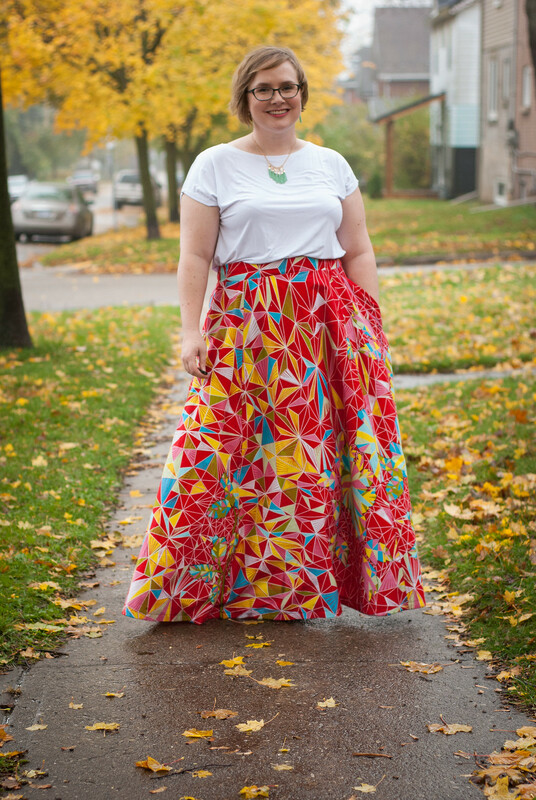 If you read Oonaballona, you won’t be surprised that this skirt came out of a conversation I had with Marcy about if white women can pull off African wax print respectfully. The overwhelming message from Marcy and the broader community was “Go for it!” I don’t need to be told twice to buy rainbow-riffic fabric, so I headed to Etsy and picked up this beauty. Ankara/African wax print fabric is not cheap. A 6m cut of the good stuff from Vlisco costs $92 Canadian, before tax and shipping. A friend was in Ghana this summer, and she reports that it isn’t cheap there either! There are lots of fakes. There’s a good chance what I bought is fake because it was “only” $60 on Etsy… but it came with a Vlisco sticker on it, so who knows. I”m not actually bothered either way. $60 is still an expensive skirt for me! There are lots of shops on Etsy selling full 6m cuts or by the metre… the one I bought from is shut for a few months right now. If you aren’t lucky enough to live in London or somewhere that wax prints are carried in shops, then I think being able to order just what you need online makes sense. The colour palette of lots of wax prints are perfect for a warm-toned or brown skin. Most of the prints I’ve seen have warm colours, like ochre yellow, acid green, and deep orange. I’d put those colours in the category of “amazing on someone else” and not so flattering on my particular shade of pale pink. Jasika had a good discussion of this topic in her recent post, if you are interested. When I chose a print, I picked a more modern design in slightly cooler colours that I thoughts would fit my wardrobe best! It’s actually waxy! (I know, that sounds so obvious!) When the fabric arrived, it had a light layer of wax all over it. I chose to wash it first, because I wanted to have an easy-care garment, but traditionally I think the wax gives it structure and an elegant sheen. I wanted the drama of a maxi, but without any bulk at the waist from pleats or gathers. I cut a bit of extra ease in the back and inserted an elastic waistband, as several people suggested on Instagram. The end result is a pull on skirt with no zipper that is comfortable to wear! I don’t think the elastication is even noticeable. 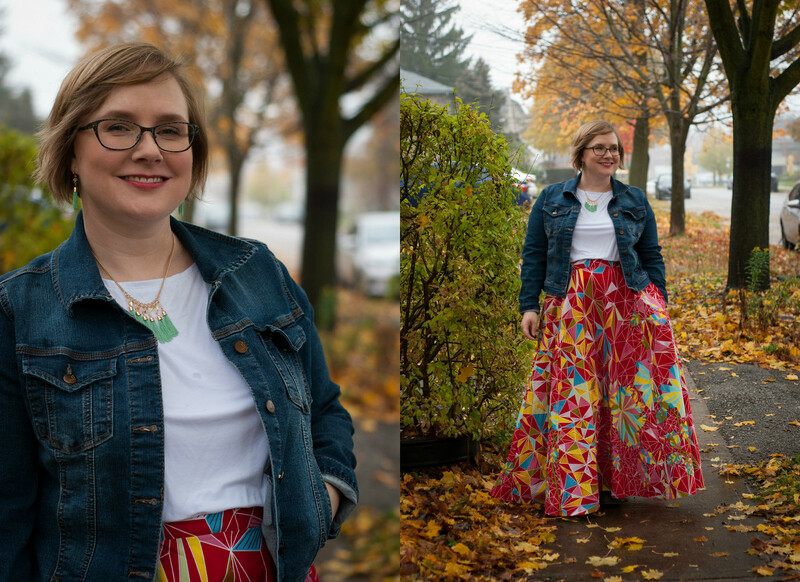 By time I sewed this, the weather was cooling off, and the season for an epic summer maxi had passed. I asked on Instagram for styling advice, and everyone suggested keeping it simple with neutral colours. I’m not sure the proportions of my denim jacket are quite right, but I think the idea works! I’ve packed the skirt away until the summer, but I’m excited to wear it then. Now that I’ve incorporated African wax prints, I’m looking around for more fabric diversity to add into my wardrobe. It’s that fine line between cultural appropriation and a loving tribute that I’m trying to watch. I’ve got a great piece of Indian border print with scenes of courtly life that I’d like to make into a tank – if I don’t just dig straight into my stash of sari fabrics and cotton from when I studied in India, that is! I’m also hoping to stop by the local rural fabric store when my Mennonite students buy the polyester florals for their dresses, and wondering what I could make myself that would be fun for them to see me wearing. I talk with the older girls a lot about their clothes and mine – they are fascinated that I sew, but in a very different way to their moms. Every once in a while, I spot someone wearing Fabricland prints that I recognise! Have you sewn with African wax prints, or other fabrics associated with specific cultures/parts of the world? And what do you think of my maxi skirt? Thank you! I’m hoping it s a fun statement garment to wear in summer!! This is beautiful! I like the jean jacket with it. Leather moto would be awesome too!! I spent SO long trying to figure out what would actually look good in this fabric and also be something that I would want to wear! I”m quite glad I didn’t go with a jacket or a fitted dress, which were my other top options! Love the maxi skirt! You’ve paired it well with the white tee and jean jacket, too. I haven’t sewn with African wax print yet (although I did buy a 6-yard piece at a local African grocery/shop here in Vermont and chatted with the owner about what I was planning to make), but have sewn plenty with Indonesian batik and ikat fabrics, and Thai mudmee (similar to ikat), that I bought when I lived there. In Jakarta and Bangkok, people LOVED it when I wore things I’d made from their traditional fabric; it made them really happy that I appreciated the craft. I don’t have a sense yet of how it would go over here in the U.S. if I met an Indonesian or Thai person while wearing their traditional textiles. I would hope that they would see that from my perspective it is completely cultural appreciation… I love the look of their textiles and have nothing but awe and appreciation when it comes to the history, skill and work that goes into making them. I feel like living in a place gives you the “right” to wear traditional textiles… and honestly, I think it’s probably something that left-wing white women worry about more than we should! But then again, I’d rather err on the side of caution! 😉 I always love seeing what you’ve made with traditional fabrics! Beautiful! I have 2 yards of a wax print that I’m still debating what to do with. Jacket? Blouse? We shall see. Both good options! I was really tempted by a little jacket, too! I also love authetic fabric from around the world! Fabric weight and structure often dictate style (as well as reflect cultural traditions and mores). This makes it difficult (or thought provoking!) to incorporate some fabrics into modern western clothing design. Your skirt does that well! Well said! 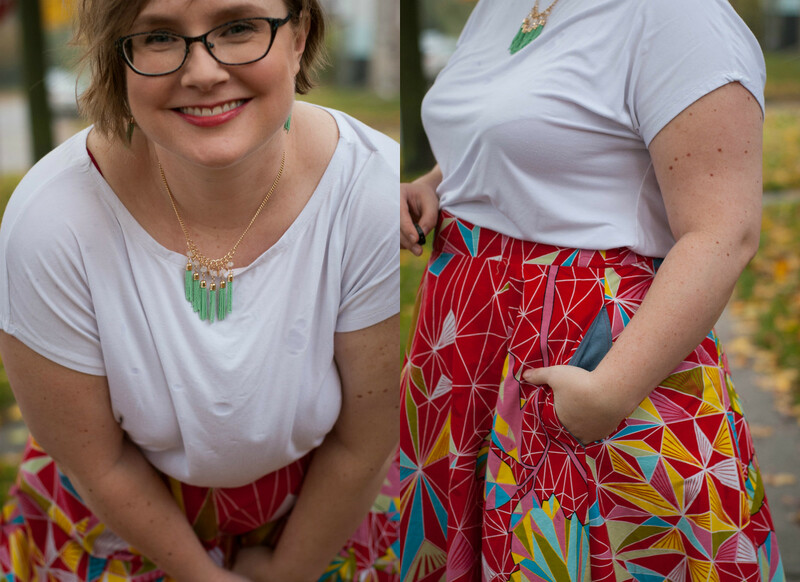 This fabric is so densely woven that it will only ever suit a structured garment, and that’s not generally what I wear day-to-day… but it sure does sew well into the typical wax print peplum tops and fitted skirts!! Love your skirt. As a white woman, I worry about what I can wear from other cultures while being respectful too. My partner is from South Africa and while we were there visiting I bought some wax print fabric. The vendor was super happy to sell it to me (and make some money) and others I met thought nothing was strange about using it. I likely wouldn’t make traditional clothing from it and I would certainly not use something considered sacred or spiritual but it seemed like making modern clothes and home decor for myself was no problem. I think the other part of this conversation that has been coming up lately is the way some companies are profiting on another’s culture (tribal and Aztec prints maybe fall into this category). This comes up a lot in BC where the cowichan people have advocated for people to buy cowichan sweaters made by them instead of those made by noncowichan companies. Always interesting to learn and think about. I hope you sew up your wax print! I think you’ve explained perfectly the difference between traditional handicrafts that honour and profit the original community vs other people profiting off their intellectual property. Context really is important! I made a quilt out of African Dutch wax fabric once, years ago. I have always admired it (there are stores in New York’s Garment District that sell it) but I haven’t ever seen a print I really wanted to try for clothes. Earlier this year I made a dress out of a sari. My Indian and Indian-American friends told me that refashioning saris is not just OK, it’s “in.” As long as the sari is not a valuable antique or made for a wedding or specific religious ceremony, it’s fine. What a colourful quilt that must have been! Did the fabric soften up in time? Very nice! I love African prints, I love saris, I don’t dress up in ethnic gear or wear blackface so I don’t worry about it. I’m surprised it’s so expensive for you though, it’s bargainalicious here! I thought it must be cheaper to get wax prints in the UK, because so many British bloggers sew with it! It’s definitely a luxury item here! I love the skirt, and I love it with the jacket. I wonder how it would be with a chambray sleeveless blouse this summer? It’s beautiful. Yesssssssssssssssssssss I LOVE this! Those colours are so happy, and the skirt looks so swooshy and fun. I’ve always felt hesitant about wax prints too but every person of African descent I’ve ever asked has basically been confused why I would have a problem with it. I think it’s a bit like Chinese brocade in that that is not a part of the culture that is oppressed. So, like… white people wearing dreadlocks are a problem for a lot of reasons but a big part is that black people with dreadlocks or natural hair are judged negatively. So a white person is trading on the ‘cool’ part and not dealing with negative consequences. And it’s not a sacred thing in itself, so it’s fine. I definitely agree with Renee that I wouldn’t use it to make traditional clothing, that would feel weird to me. I agree with ‘ethnic’ and ‘tribal’ prints. It’s always so disappointing. I have complained a bunch of times to my local box store about them and it all goes into the void and nothing ever changes but I’m going to keep doing it because man. It’s not ok!! Good for you for complaining to your local store!!!! Hopefully you’ll get through to them eventually! Awesome skirt! I would love to try this colourful style. My niece spent three months in Benin recently and she bought the most delightful wax fabrics there. But, as you said, the good stuff wasn’t cheap, she reported. Ooh! Are you going to sew her something with her fabric haul, or does she sew herself? This is majestic!!!!!!!! LOVE THAT FABRIC. 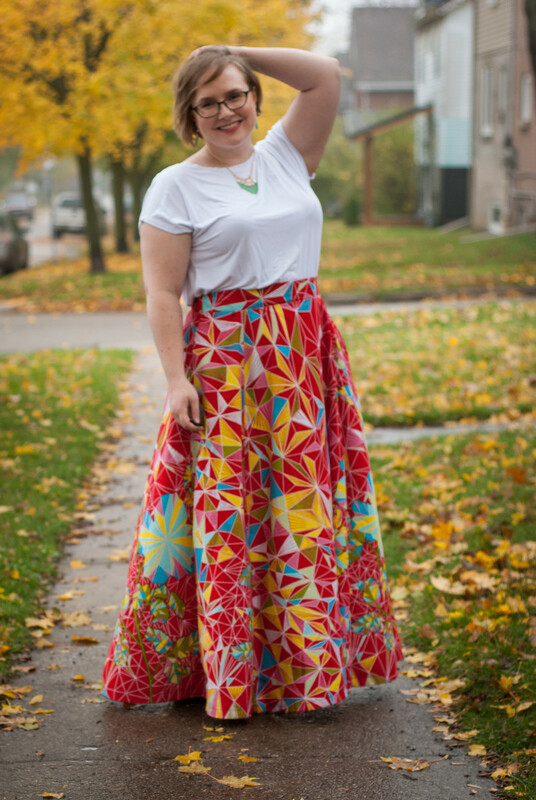 While I’ve never sewn with wax prints (but I plan to), I absolutely love your skirt! Did you cut and lengthen it at the cut line? This is gorgeous! 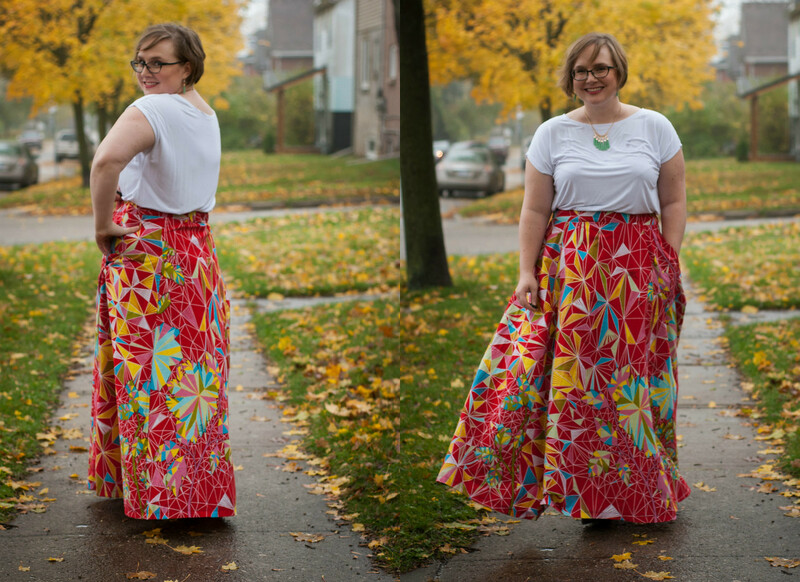 Personally I love maxi skirts in winter, but I hope it’s not too long before you get to enjoy it. One of my favourite things about working in a fabric store is getting to observe the different groups that make up our customers. We have a lot of First Nations customers, and a pretty large Mennonite contingent. Digging up an older post here, but do you happen to remember roughly how much ease you added to the back of the skirt? I am doing a maxi from the same pattern and second guessing myself. Thanks! Good question! I think I added about 4″ – basically you need to make sure it is slightly larger than you hips or shoulders, which ever way you prefer to put it on! Thank you so much! Also I forgot to mention in my original question but I LOVE the skirt you made. It is totally the inspiration for my project.